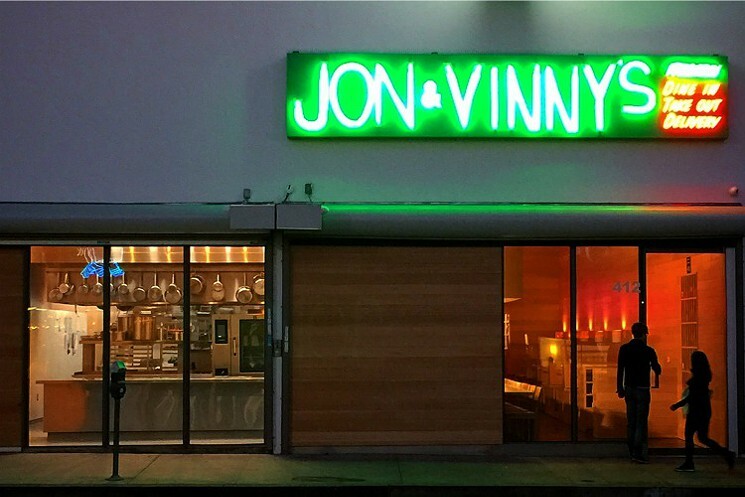 Jon and Vinny’s on Fairfax is an Italian restaurant that opened Fall of 2014, and has been wowing guests with their simple recipes and eloquent decor. Jon and Vinny’s is opened all day, serving breakfast, lunch and dinner. Their menu varies from classic Italian favorites and pizza dishes with unique names for every one. With names like “White Lightning”, “Jersey Marinara” and “LA Women” all uniquely created at the restaurant for your enjoyment. Their decor, on the other hand, is so simple and beautifully wood paneled; it makes you feel relaxed and ready to eat. Jon Shook and Don Vitolo have opened several restaurant prior to this one, but none have been self-named. Jon and Vinny’s on Fairfax is in prime location for central Los Angeles, competing with all other restaurants in the area but this one tends to stick out. Jon & Vinny’s on Fairfax also has great reviews on Yelp! Fans strongly recommend trying the Spicy Fusilli Vodka pasta. It consists of a spicy vodka sauce, fresh basil, & grated parmesan. The sauce has just the right amount of heat and who doesn’t like curly pasta? The best part: all of their pasta is homemade. Don’t forget to come hungry, very hungry for that matter because you are going to want to try everything on the menu!